From feather and fan to faux colorwork, you'll love working with Freia Flux Self-Striping Lace weight yarn. Available in a range of vibrant color combinations, you'll want to enhance your stash with all of them! 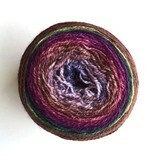 Once hand washed using a wool wash such as Eucalan, this yarn blooms to a nice round 2-ply that has bounce in its step.